As we continue to focus on the Fruit of the Spirit, today we think about Goodness. It seems only appropriate to me to reflect on the goodness of Jesus Christ and what He did for us on this memorable day. Jesus was arrested around 1:30 a.m. on Friday and in less than 14 hours, he was dead. He was tried in three different courts, flogged, and sentenced by Pilate. He was abandoned by all except a few loyal followers. 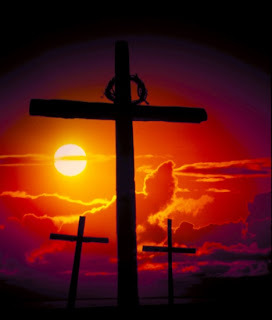 He was stripped of his clothes and walked the 650 yards to Golgotha - the place of the skull - to be crucified on a cross. But Christ shows His uncommon goodness as Luke 23:34 records His words from the cross, "Father, forgive them, for they do not know what they are doing." Satan was defeated by Christ's work on the cross. We can experience victory over our sin and eternal life with God the Father as we accept His gift of life. Christ died so we can live. Romans 6:23 tells us, "For the wages of sin is death, but the gift of God is eternal life in Christ Jesus our Lord. Thankfully, the story of the cross doesn't end there. Christ was resurrected from the dead three days later, fulfilling the prophecy from the beginning. His empty tomb was found by his followers, whom he spent 40 days with on earth before his return to heaven. Christ's goodness, as reflected on the Cross, is more than any of us can offer. But what a great reminder it is for us to continually work toward showing greater goodness toward those around us. Praise God we are worshiping a risen Savior.